Model T Ford Forum: Why does my T leak oil in reverse? Why does my T leak oil in reverse? Model T Ford Forum: Forum 2014: Why does my T leak oil in reverse? Everything is ship shape, except that when I back into the garage, it leaves a line of oil drips, apparently coming out of the hog's head on the left side. The external pedal/clutch mechanisms are soaking wet with oil. It leaks no oil while running forward or sitting idling, but in reverse it leaves a very obvious trail. My first thought was that the reverse pedal shaft journal, the bearing on the hog's head, or both are warn out. Inspection and attempts to wobble the pedal indicate that the reverse pedal shaft is tight and it still has its factory-new tolerance. So, why does she leak in reverse? I'm not sure how you checked the pedal shaft clearance with it installed. There's too much tension on the shaft. Jack up the rear end and run it. Watch the area while you depress the pedal by hand. Do your pedal shafts have O-rings on them? I have them on mine and they seem to do a good job. 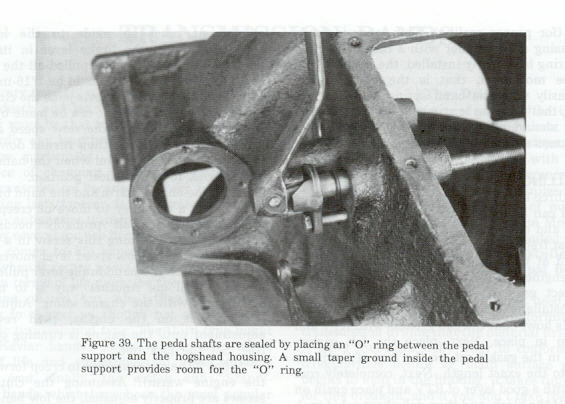 Here's a picture from the MTFCA transmission handbook that shows where the O-ring goes. Thank you for your suggestions. The expertise of the hoard is a very strong point of this forum. The only way to see the leak was to crawl under it with the engine ticking over at a fast idle. With a light, I pinpointed precisely the leak. Turns out, it has nothing to do with the reverse. The fact is, I go blasting out of the garage with the oil fairly cool, and I come back with everything hot and back in ever so slowly. It's a tight fit. Its the slow ground-speed that makes the oil-trail obvious. The excess oil around the pedal shafts was the result of my enthusiastic lubrication of the clutch mechanism. The leak is at the hog's-head/pan interface, right under the Bendix cover. When I re-installed the hog's head, I apparently captured a tiny piece of debris on top of the gasket or maybe I nicked the gasket. It needs a new gasket. I'll undo the pedals, take out all the bolts, jack up the left side of the cover, and try to sneak in a new gasket. Not today. It's interesting the way the oil looks as it leaks out with the engine running. It's an opaque, brown fluid. Looks like brown paint. It's apparently a finely divided mixture of oil and air. As it forms drops and hits the floor, it turns back into its familiar translucent fluid. The oil in that engine is subjected to some real violence. I can see now why the "dry sump" was a big feature for cars back in the 50s. It kept the oil from being whipped into a foam. Would it be downhill backing into the garage? If so, some oil might be draining out the universal joint. Only other thing I can think of is that when you have the reverse band on, the rest of the transmission including the brake drum turns in the opposite direction than when you are going forward. Inside the oil would be thrown up on the side toward the pedals while when going forward it is thrown up on the other side. No, it's definitely coming through the interface between the transmission cover and the pan, right behind the rear engine mount. At that point, the oil pressure is at its peak from being flung forcibly against the inner wall by the flywheel, and as Mark Chaffin pointed out, that's why the oil chooses to come out there. The slightest error in the flatness of the pan will result in a leak at this point, left and right. The fix is to use a new gasket, fortified with Permatex. I had assumed it was leaking only when in reverse, but it turns out that the car moves the slowest when I am reversing into the garage, and the drips become obvious on the floor. It leaks constantly.